1. And love is something eternal, it may change in aspect but not in essence. 2. It is good to love many things, for therein lies the true strength, and whosoever loves much performs much, and can accomplish much, and what is done in love, is well done. #3 Letter to his brother Theo, 18 September 1888: Tu es bon pour les peintres et saches le bien que plus j’y réfléchis plus je sens qu’il n’y a rien de plus réellement artistique que d’aimer les gens. 3. You’re kind to painters, and be sure that the more I think about it the more I feel that there’s nothing more genuinely artistic than to love people. 4. Love always brings difficulties, that is true, but the good side of it is that it gives energy. 5. Love this friend, this person, this thing, whatever you like, and you will be on the right road to understanding Him better, that is what I keep telling myself. Excerpt from Wikipedia: Vincent Willem van Gogh (30 March 1853 – 29 July 1890) was a Dutch post-Impressionist painter whose work had a far-reaching influence on 20th century art for its vivid colors and emotional impact. He suffered from anxiety and increasingly frequent bouts of mental illness throughout his life, and died largely unknown, at the age of 37, from a self-inflicted gunshot wound. 1. When we are working at a difficult task and strive after a good thing, we are fighting a righteous battle, the direct reward of which is that we are kept from much evil. As we advance in life it becomes more and more difficult, but in fighting the difficulties the inmost strength of the heart is developed. 2. Some good must come by clinging to the right. Conscience is a man’s compass, and though the needle sometimes deviates, though one often perceives irregularities in directing one’s course by it, still one must try to follow its direction. 3. Two things that in my opinion reinforce one another and remain eternally true are: Do not quench your inspiration and your imagination, do not become the slave of your model; and again: Take the model and study it, otherwise your inspiration will never become plastically concrete. 4. How I’d like to talk to you about art again, but now we can only write to each other about it often; find things beautiful as much as you can, most people find too little beautiful. 5. For great things do not done just happen by impulse but are a succession of small things linked together. 6. My existence is not without reason! I know that I could be a quite a different person! How can I be of use, how can I be of service? There is something inside me, but what can it be? He is quite another idler. If you like you may take me for one of those. 7. I dream my painting, and then I paint my dream. 8. What am I in the eyes of most people — a nonentity, an eccentric, or an unpleasant person — somebody who has no position in society and will never have; in short, the lowest of the low. All right, then — even if that were absolutely true, then I should one day like to show by my work what such an eccentric, such a nobody, has in his heart. That is my ambition, based less on resentment than on love in spite of everything, based more on a feeling of serenity than on passion. 9. Though I am often in the depths of misery, there is still calmness, pure harmony and music inside me. I see paintings or drawings in the poorest cottages, in the dirtiest corners. And my mind is driven towards these things with an irresistible momentum. 10. Well, and yet it was in these depths of misery that I felt my energy revive and I said to myself, I shall get over it somehow, I shall set to work again with my pencil, which I had cast aside in my deep dejection, and I shall draw again, and from that moment I have had the feeling that everything has changed for me, and now I am in my stride and my pencil has become slightly more willing and seems to be getting more so by the day. 11. If only we try to live sincerely, it will go well with us, even though we are certain to experience real sorrow, and great disappointments, and also will probably commit great faults and do wrong things, but it certainly is true, that it is better to be high-spirited, even though one makes more mistakes, than to be narrow-minded and all too prudent. 12. Someone has a great fire in his soul and nobody ever comes to warm themselves at it, and passers-by see nothing but a little smoke at the top of the chimney and then go on their way. 13. But it seems to me right after all to keep the enthusiasm of those days in the present time, for it is often true that fortune favours the bold, and whatever may be true about fortune or “la joie de vivre,” as it is called, one must work and dare if one really wants to live. 14. And the painted portraits have a life of their own, coming straight from the painter’s soul, which the machine cannot reach. The more one looks at photographs, the more one feels this, I think. 15. Poetry surrounds us everywhere, but putting it on paper is, alas, not so easy as looking at it. 16. Despite poverty, we’ll take the chance. The fishermen know that the sea is dangerous and the storm fearsome, but could never see that the dangers were a reason to continue strolling on the beach. 17. What is true is that I have at times earned my own crust of bread, and at other times a friend has given it to me out of the goodness of his heart. I have lived whatever way I could, for better or for worse, taking things just as they came. It is true that I have forfeited the trust of various people, it is true that my financial affairs are in a sorry state, it is true that the future looks rather bleak, it is true that I might have done better, it is true that I have wasted time when it comes to earning a living, it is true that my studies are in a fairly lamentable and appalling state, and that my needs are greater, infinitely greater than my resources. But does that mean going downhill and doing nothing? 18. I must continue to follow the path I take now. If I do nothing, if I study nothing, if I cease searching, then, woe is me, I am lost. That is how I look at it — keep going, keep going come what may. 19. I feel a certain calm. There is safety in the midst of danger. What would life be if we had no courage to attempt anything? It will be a hard pull for me; the tide rises high, almost to the lips and perhaps higher still, how can I know? But I shall fight my battle, and sell my life dearly, and try to win and get the best of it. 20. But I keep on making what I can’t do yet in order to learn to be able to do it. 21. If you hear a voice within you saying, “You are not a painter,” then by all means paint, boy, and that voice will be silenced, but only by working. 22. One must undertake it with confidence, with a certain assurance that one is doing a reasonable thing, like the farmer drives his plough, or like our friend in the scratch below, who is harrowing, and even drags the harrow himself. 23. I tell you, if one wants to be active, one must not be afraid of going wrong, one must not be afraid of making mistakes now and then. Many people think that they will become good just by doing no harm – but that’s a lie, and you yourself used to call it that. That way lies stagnation, mediocrity. 24. But no matter how vacant and vain, how dead life may appear to be, the man of faith, of energy, of warmth, who knows something, will not be put off so easily. 25. It constantly remains a source of disappointment to me that my drawings are not yet what I want them to be. The difficulties are indeed numerous and great, and cannot be overcome at once. To make progress is a kind of miner’s work; it doesn’t advance as quickly as one would like, and as others also expect, but as one stands before such a task, the basic necessities are patience and faithfulness. In fact, I do not think much about the difficulties, because if one thought of them too much one would get stunned or disturbed. 1. I put my heart and my soul into my work, and have lost my mind in the process. 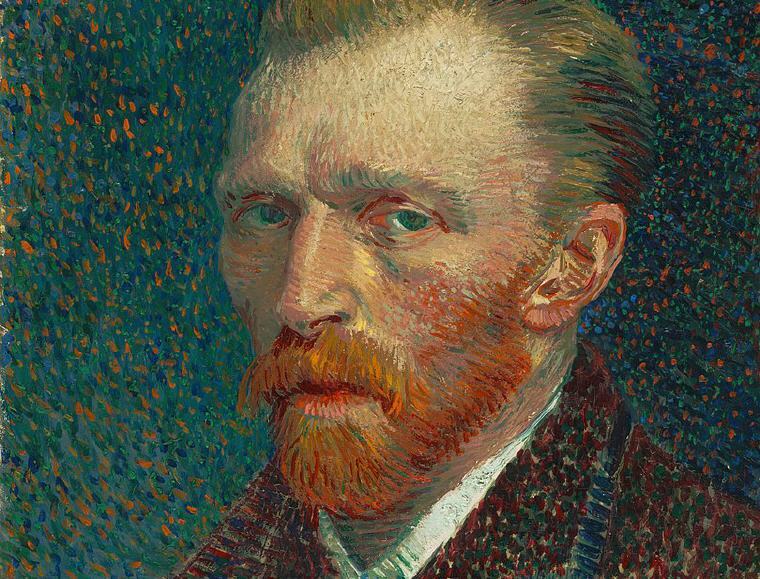 Vincent by Don McLean was written as a tribute to Vincent van Gogh. 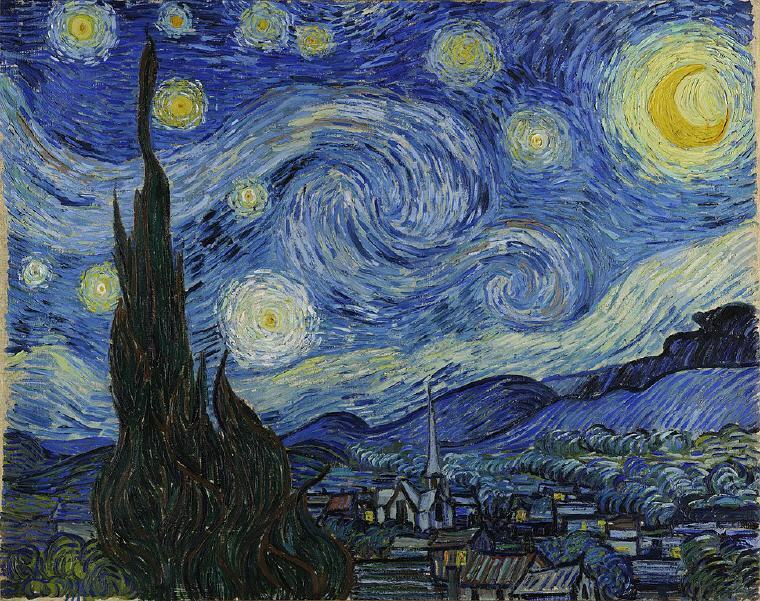 It is also known by its opening line, “Starry Starry Night“, a reference to Van Gogh’s painting The Starry Night (the painting on the left). The song also describes different paintings done by the artist.